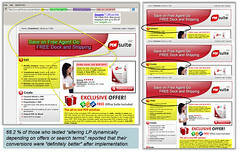 Landing Pages are also referred to as Call-to-Action Pages. After you have created your Call-to Action campaign, landing pages are where you want your visitors to find more information that can lead to a conversion. Collecting data may also be your objective. Keep these pages simple, as the message or offer is the most important aspect. Main navigation is not included. More on landing page forms next time. On February 20, 2011, my half of the DIGM 3350 class visited ADPOWER at 2:30 pm. I got lost but was only 3 minutes late, went in a circle about three times. I missed our tour guide’s name and his affiliation with the organization. I am pretty sure he is a manager or owner of this screen print shop. ADPOWER has been in business over 15 years and 80% of their sales are return clients. That’s impressive. He guided us through the process of screen printing. The first step is to sell the job. The client will need art work and a product to print it on, usually a T-shirt. The client can provide their own art work or the in-house Art department can take an idea and create an image with that idea. No matter where the art work comes from, if it has more than one color, a transparency and a screen is needed for each color. We went out to the shop and our guide showed us the order forms on the wall waiting to be processed. He said that this form follows the job until completion. Next we went into the screen room. This is where the coated screen waiting on a new job. These screens are coated with emulsion. The screen is then exposed to a bright light. This light burns out the part of the screen that you don’t want. The screen then hardens and the unwanted film is washed away. I think was interesting that we got to see how to fix a hole in the screen. TAPE IT. With ready screens, the first thing to be done is registration is. This is done with a T-square each time a new color is introduced. When all the colors are printed, the job is checked against the order form. The job is then broken down and sent out to the customer. After the job, the screens go into “quarantined” where cleaned. There are two options at this point: 1) Save the screen because the client knows they will reprint or 2) The screens are stripped of the emulsion. If there ghosting or a haze of the last job, the screens must be power-washed. The screens are coated with emulsion for the next job. I would choose to do business with the ADPOWER because they know their stuff. They have been doing screen printing for a long time and it shows. I like their business model and would be confident I would receive a quality product. The DIGM 3350 class did not have to venture far this week. 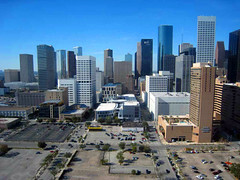 Between the U of H campus and downtown Houston was the manufacturing printing plant called Chas. P. Young Co. CPY is under the corporate umbrella of Consolidated Graphics, one of the nation’s industry leader in printing production. This organization provides many services, more than we covered. Our focus remained on lithography. Robert was our tour guide. He graduated from our program in 2009. I remembered him from speaking at an IGAEAUH meeting. Our first tour stop was the Sales Area. This is where the Executives live. The real control of the company also resides here, Sales and Finance. The salesmen bring in a requests for an estimate. Three estimator price the job and return it back to sales. When the sale is made, the project moves to preproduction. A Customer Service Representative (CSR) is assigned to the client to assure the project is done right. We ventured down the hall to the Pre-press department. This is where the client sends their image file. A color proof from that file is produced to check all the variables and to get an OK from the client. If the client does not provide their own file, the graphics setup charge run around $200/hr. Our next stop on the tour was the Press Room. In one area, there was 2 40″ 6 color, sheet-fed lithographic presses. One of the presses was down, so we got to get really close and checked out the delivery system between towers. Of course I asked what something was that nobody knew what it was. The other machine was in the process of make-ready, which includes setting up press, installing the plates and preparing all the systems. Each tower has its own plate and produces one color. These six towers produce CYMK plus a spot color and an aqueous coating that dries almost instantly. This seals the ink, protects the output and allows for faster processing. They also have a Ryobi, just the one in our image transfer lab. It is 18″ 2 color lithographic press. CPY uses theirs for business stationery and small runs because it is more economical. Next we got to take a peek at the 4-color cold-set full web press. The cold-set attribute means that the substrate is of newspaper quality. This press has a variation on the printing method. It is called blanket-to-blanket. These two cylinders act as each others impression cylinder, so it is eliminated. Because of this, the press is categorized as a perfecting press or duplex. Two color are printed per side using the same lithographic process as other presses. The difference is this press can run 500-700 ft/min and the web rolls are less expensive. Our last stop was the Bindery. There was a Challenger paper-cutter like ours. Folding machines were being run and mail was being prepared to go out. The process that had everyone’s attention was the saddle stitching line machine. the signatures were hanging over a bar that dropped them in order along the conveyor belt, then they are stitched and trimmed on three sides. Very efficient. I would do business with CPY because they are an established organization, backed by a powerful industry leader. They are service-driven. I think that the organization would go out of their way to make sure I was happy as a customer. It’s easier to keep a customer that trying to gain a new one. I know CPY understands this. I remember hearing Robert speak about his experience through CGX‘s Leadership Development program. That was a year and a half ago. When I saw his face, it all came back to me. I found the career information and am going to apply.